Defending Kentucky's Coach Calipari: Not A Tough Assignment : The Two-Way John Calipari's detractors argue that he's less of a head coach and more of a head recruiter. But his success rests on the fact that he can honestly tell his potential players that he will prepare them for success in college — and then success in the NBA. 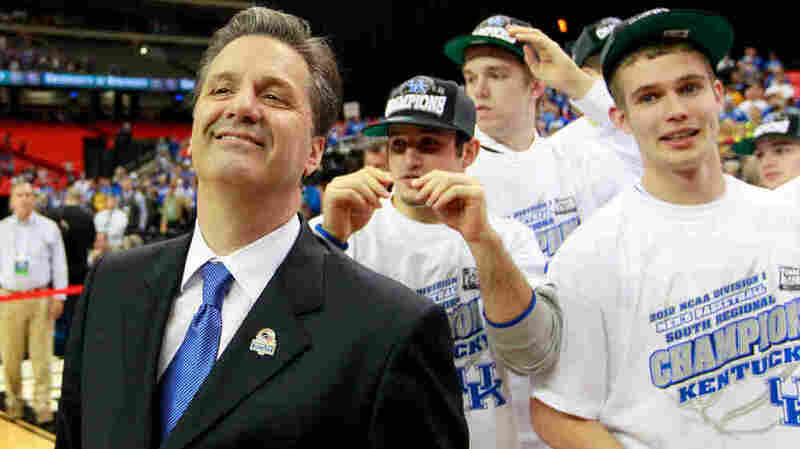 Kentucky coach John Calipari has been criticized as being more of a recruiter than a coach. But that doesn't mean his approach to the game is easy. The critique of University of Kentucky head basketball coach John Calipari is that he does what it takes to get his players, and they do what they want from there. Sure, this thinking goes, he's yelling at them from the sidelines whenever one — specifically Terrence Jones — puts up a 3-point shot from a step behind the arc. But he's not much of a coach. Some criticisms are incontrovertible: Calipari has had great talent, but never won a title. The first time a Calipari-coached team ever beat a higher-seeded team in the NCAA tournament was last year (of course, it's impossible to beat a higher-seeded team when your team is a No. 1, as Calipari's teams have been five times). On Saturday, Calipari's top-ranked Kentucky will play No. 4 Louisville for a spot in the NCAA title game, at 6:09 p.m. EDT. The evening game, between No. 2 seeds Kansas and Ohio State, follows at 8:49 p.m. EDT. The championship is Monday night at 9 p.m. EDT; all games are being broadcast on CBS. This weekend, we'll see Calipari coaching a bunch of future NBA players, which is why Calipari's detractors argue that he's less of a head coach and more of a head recruiter. If Bob Cousy was the Houdini of the hardwood, maybe Calipari is the Svengali of the sought-after 17-year-old. Now that I've set up a straw man of WuShock-esque proportions (OK, WuShock, the Wichita State mascot, is actually a wheat man) — allow me to knock it down. Yes, Calipari is a great recruiter, a title that comes with some baggage in college sports. "Great recruiter" is sometimes meant to stand for "great salesman," with no acknowledgment that selling is easier when the product is of high quality. No one calls Duke coach Mike Krzyzewski a great recruiter, though with 50 McDonald's All Americans to his credit, he certainly is a great recruiter; it's just that the phrase "great coach" trumps all. Calipari's strength as a recruiter rests on the fact that he can honestly tell his potential players that he will prepare them for success in college — and then success in the NBA. All coaches, or at least all the coaches in a position to be invited into the living rooms of high school seniors with realistic NBA goals, tell their players this. Calipari's track record of creating young NBA millionaires is remarkable. Of course, the churning of players who spend a year in college — or perhaps more accurately, a semester and a half in college — and then go on to the NBA is the source of great consternation, at least among the greatly consternated. This cohort includes the establishment of college basketball, most older pro players, NBA retirees and anyone who has ever begun a sentence, "Back in my day ..."
In truth, both the pro and the college game would be improved as entertainment, were collegians made to stay in school for three or four years. It wouldn't be fair, but it would be more entertaining. But that's not how it works in college basketball. And Calipari is seen as the embodiment of this evil. He has benefited from one-and-doneness; no one has profited from child labor like that since Fagan. This, despite the fact that Calipari says he is against the rule that allows players to leave college for the pros after just one year. I don't doubt his sincerity on this, by the way; but I don't really credit him. It is in every coach's self-interest to keep players longer. Actually, maybe not every coach. Writing recently in Grantland, Chuck Klosterman said that if these Wildcats win the championship, it will change college basketball forever. What's wrong with Klosterman's argument is that basketball has already changed. All the teams he lists as falling under the spell of one-and-done players are all very willingly ensorcelled. Klosterman writes, "Calipari's scheme will become standard at a handful of universities where losing at basketball is unacceptable: North Carolina, Syracuse, Kansas, UCLA, and maybe even Duke" — to which I say: Marvin Williams, Brandan Wright, Carmelo Anthony, Donte Green, Xavier Henry, Josh Selby, Jrue Holiday, Kevin Love, Trevor Ariza, and maybe even Luol Deng, Corey Magette, Kyrie Irving and, it's been announced, Austin Rivers. The Calipari model is treated as if other coaches could easily ape it, were they to simply set aside their own code of ethics. In fact, it is a grueling strategy that only seems to work because Calipari has had success with it. But succeeding under such circumstances is far from ensured. The high-churn model leaves a team vulnerable, leaves a recruiting staff tired, and — perhaps most terrifying for a college coach — cedes power to the vagaries of luck and the maturity of 19-year-olds. Succeeding under such circumstances is far from ensured. In fact, it's a remarkable achievement that one of these highly touted teams hasn't fallen on its face. Calipari is said to be on the cusp of joining the ignominious company of coaching underachievers — he must win a championship, some say, to avoid his "biggest failure to date." In fact, Calipari is operating at a very high level, and on a razor's edge. I would say he's just playing by the rules he's given, but NCAA rulings have, of course, punished past Calipari teams for violating rules. No Calipari assessment can go without mentioning that, so it is hereby noted ... oh, and the fact that he once drove to Canada with Scott Padgett tied to the roof of his car.